The Trilogy Between Chukotka and Alaska. Dmitry and his sons Nikita and Matvey decided to cross the Bering Strait by ski. During four days (March 16-20) the travellers managed to cover 52 km along drifting ice. They sailed along vast area of open water on a rubber boat. A she-bear with bear cubs had visited the camp of the courageous explorers. 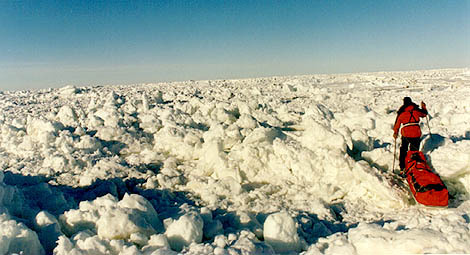 During the night (March 19-20) there begun a head ice drift with the rate 3 km/hour. 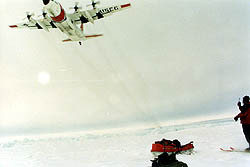 The camp was drifted 150 km away, the skiers were carried into open sea and decided to give SOS signal. At that time there was a very strong wind at Chukotka and helicopters and airplanes could not take off. Under such conditions for the first time in history of relations between Russia and the USA the Russians addressed Americans with the request to render assistance and the US Coast Guard carried out the rescue operation. Dmitry, Nikita, Matvey Shparo and Elija Novikov, a cameraman, started from the shore of Chukotka on February 28,1997. Elija Novikov got his hands frost-bitten and needed an urgent medical first aid. He was evacuated. The second start took place on March 7, 1998. Nikita Shparo had twice plunged in water (on March 7 and March 8). The stove and a ski were drowned. The explorers called out a helicopter. They supposed that a helicopter will evacuate Nikita Shparo. A helicopter did not manage to find the group neither on March 10 nor on March 11. The skiers resumed their moving. The rescue helicopter appeared on March 13, when the group was successfully moving ahead along its route to the Point Hope, an American settlement The group was forced to agree to evacuation as all financial resources allotted for possible rescue works had been depleted. 1998. The first ever ski crossing of the Bering Strait. The mistakes of the two previous attempts had been taken into account. Dmitry and Matvey Shparo explain the failure in 1997 as the result of the following reasons: insufficient mutual understanding between skiers, the headquarters of the expedition in Moscow and the pilots at Chukotka. The last year's mistakes have been eliminated in the present expedition. Two base groups are organized: one – in Lavrentiya settlement, Chukotka, and the other – in Nome, Alaska. Sergey Yepishkin and Dmitry Vladimirsky, participants of the expedition, will work at the Chukotka base station and the other participants – Alexey Peskov, Elija Novikov and Thomas Gordon, a Canadian citizen, will work at the Alaska base camp; Sergey Yepishkin is the leader of the two base groups. The communication between the skiers, base groups and the headquarters in Moscow will be maintained by satellite phones, passed over to the participants of the expedition by the Norwegian Company NERA. Packard Company. These computers will provide the opportunity to the members of the base groups to have charts of weather forecast and also of ice conditions. The information will be specially prepared and send by the specialists of Rosgydrometzentr (Sergey Sokolov is the Manager of the Marine and Glacial Laboratory).